When was the last time you spent $11.97 on this hobby and came away with 3 autographs, 1 rookie, and 3 serial numbered inserts? For me the answer was today after receiving one of three orders I placed during Blowout Cards overwhelmingly successful Black Friday promotion. They had some A-M-A-Z-I-N-G deals but I played it pretty conservative all-in-all. I had no problems with any of my orders unlike some people. I could be wrong but I think the trick is to use your cell phone. I think the mobile platform might reside on a different server thus getting less traffic and causing no hiccups or glitches. 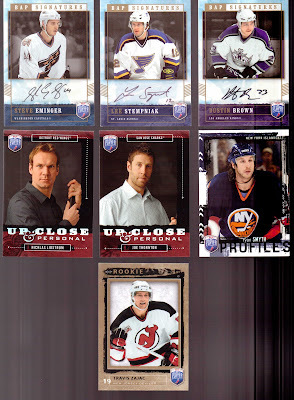 Anyway, I bought (3) blister packs of Upper Deck's 2006-07 Be A Player Hockey. Each blister had 2 packs and included one auto per. Here is a look at what I found. For twelve bucks, how can you beat that? We Interrupt Your Regularly Scheduled Programming . . .
. . . to bring you a series of musings, mayhem, and other random thoughts. Stickers should NEVER, ever be graded. When you call a product Gridiron Legends and the checklist contains more rookies than, you know, actual legends, that is called bait and switch and the equivalent of giving collectors the middle finger. The current 900lb gorilla in the room is the fact that at least one trading card company purchased bogus game used jerseys as the result of an investigation and subsequent indictments of several memorabilia dealers. Have any of them "manned-up"? Of course not. When In The Game, whose owner once swore he would never use stickers for autographs, now routinely uses them in almost EVERY product, has hell officially frozen over? SA-GE may use sticker autographs but their last product had them inserted at the rate of 40 per box, 5 per pack with a value equation of $10 per auto. Take the price of any other product and divide by the number of "hits" and what do you get? Here I'll save you the trouble. The answer is . . . not even close. The RC logo needs to go. It's confusing to novice and casual collectors and is meaningless, especially if MLBP is going to allow Topps to produce brands like the Bowman of family products. The XFractor has jumped the shark. So have the rainbow of parallels. A trademark application was filed for a product called Bowman Black. Really!?!? Another one. Seriously?! Topps announced that it has dumped more money in another worthless virtual world called, fittingly enough, Topps World, a global alternate to the domestic Topps Town. Here's a clue, how about taking that money and beefing up your autograph checklists!?! Here's a quarter, buy a clue. Just once, once, this year, I would like to open a product and pull an autograph of a veteran. I am unproven rookied out. Only in an industry like trading cards are inaccurate sell sheets and redemptions not only tolerated, but accepted as standard operating procedure. If you can't secure a player's autographs DO NOT PUT HIM ON THE SELL SHEET OR THE PRODUCT. Can you imagine the outcry that would occur if all the gamers lining up tonight for COD MW3 opened there new game to find a slip of paper that said, "Congratulations! You have received a redemption for COD MW3. Our programmers are putting the finishing touches on the product and we'll mail it to you when we damn well feel like it, if at all. If that occurs we'll send you a game of equal replacement value." PSA/DNA recently upgraded their LOA's. I wonder what prompted that? As part of a publicly traded company it seems odd that out of "the best interest of collectors" that they would increase their costs, therefore decreasing their profits without there having been a specific reason. Speculate amongst yourselves. Since Upper Deck is so busy with lawsuits that they are even suing themselves, can we, as collectors, assemble a class action lawsuit and sue Richard McWilliams for screwing up his company? Punitive damages being he has to sell the company. Small, micro manufacturers and independent minded entrepreneurs like Brian Gray (Leaf), Brian Wallos (Benchwarmer), Tom Giedeman (SA-GE), Lance Fischer (Onyx Authenticated) and Brian Price (ITG) have more passion for the hobby and their companies than all the other major manufacturers put together. When you talk to them you get the straight scoop even when the truth hurts instead of the company line. While social media channels like Twitter have proven to be an excellent vehicle for manufactures to disseminate information, the petty name calling and jabs really need to stop. It's undignified and unprofessional. We now return you to your regularly scheduled programming. This has been a random rant by the Voice of the Collector.